My big beautiful American mutt, born in the streets of Orlando, Florida. 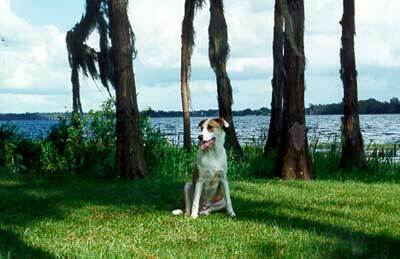 When I lived in Orlando for three years, I adopted him from Orlando Human Society. He was about 3 months old then. 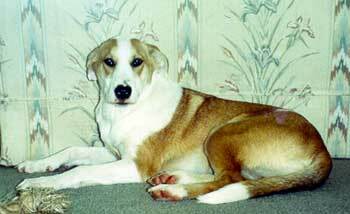 He is probably a St Bernard mix. He flew back to Sweden with me in 1995. He spent 4 months in quarantine. This evening one of my best friends passed away suddenly at home. My big beautiful american mutt, A Once In A Lifetime Dog. I can't tell you in words how much this boy will be missed. 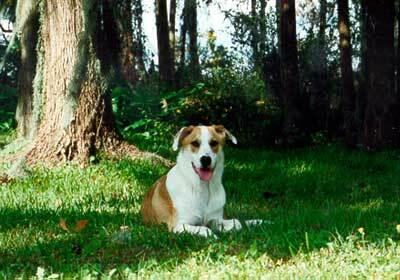 The first time I saw him he was resting in the shade at the Humane Society/SPCA of Central Florida in Orlando. I walked around for a long time looking at all different kind of dogs, it was over 400 dogs there. Although I walked by his pen three times and finaly I told one of the workers that I wanted to see more of him. I brought him to the playpen nearby, he was only 3-4 months old and I thought he wanted to play a little. *Smiling* he didn't want to play he just wanted to sit in my lap and be hugged. 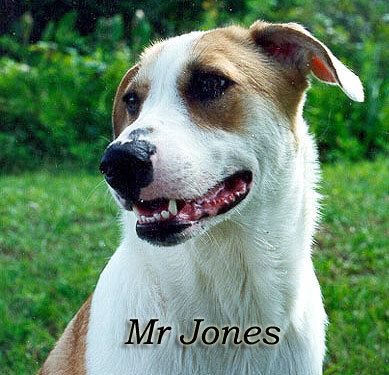 the Fairy Tail of Mr Jones began. He has taken such special care of "Ramis", "Gossip" but most of all of his best friend "Brynar" who he loved deeply and dearly. Hangin out in the shade, in sunny Florida.